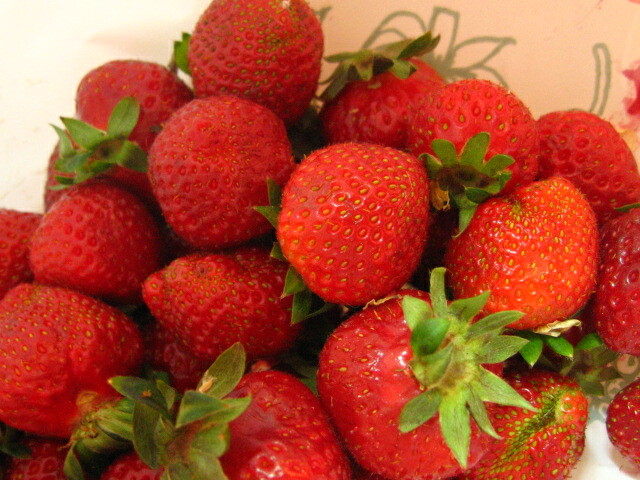 Springtime brings us one of my favorite faux fruits: the strawberry. This “accessory fruit”–or vegetable, depending on how you define it–is, in fact, the swollen tip of the stamen, or the base where the flower grows. The seeds, or more accurately, the achenes, that attach themselves to this swollen bit are more than just annoying specks that get caught in our teeth–they are, in fact, the ovaries that house the real seeds of the plant. So, just as the avocado is a delectable undercover fruit that is commonly treated as a culinary vegetable, the strawberry is a tasty summer vegetable that is almost always considered as a culinary fruit. For more information than you ever wanted to know about the strawberry, click here. 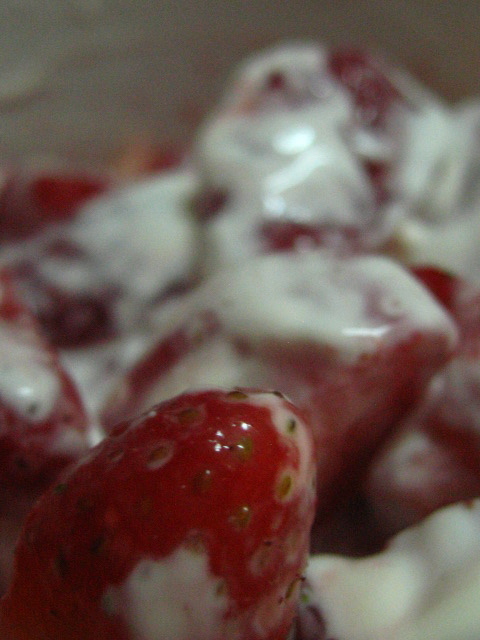 Regardless of whatever else the strawberry is, it is, above all else, delicious. I have great memories of traipsing through Buenos Aires one late November afternoon (remember–fall in the Northern Hemisphere is spring in the Southern Hemisphere). They were so sweet, so great, I bought a kilo (a little over two pounds) just after noon, ate while we walked, and it was gone by the time we sat down for dinner. My fingers were stained red from the feast. My stomach–not such a soldier that day. Not my best moment, I know. But so worth it. I have pictures of those very strawberries, somewhere on a disk. Other great strawberry finds include tiny strawberries at community markets in Normandy and Paris, and let’s not discount this weekend’s find (pictured) in Madrid at my local frutería. Can't beat fresh wild strawberries! So. Maybe I went a little bit overboard by buying one kilo when I live alone. But, in any case, I had this kilo of fresh, delicious, real–and I believe wild–strawberries (the multiple sized kind filled with juice and not genetic copies of some aesthetically “perfect” model). And I was determined to eat them all. So… I began by grabbing some and eating them simply, first by themselves, then with creme fraiche, then with regular cream. If regular cream is difficult to find where you are, just use heavy whipping cream. Preparing Strawberries: To prepare strawberries for these simple dishes, as a general rule I cut off the caps, then quarter the strawberries, then sprinkle about a teaspoon of sugar over them and mix it in. (This amount of sugar can be adjusted depending on the natural sweetness of the particular strawberry.) A very light syrup should start to form from the juice of the berry and the sugar. Then mix with the cream or creme fraiche, if desired. These were small and sweet enough that I didn't have to quarter and sugar them; but it's generally a good idea if you're getting the larger, "American" variety of farmed strawberry. With creme fraiche. And after all that eating… I still had at least half a kilo left. 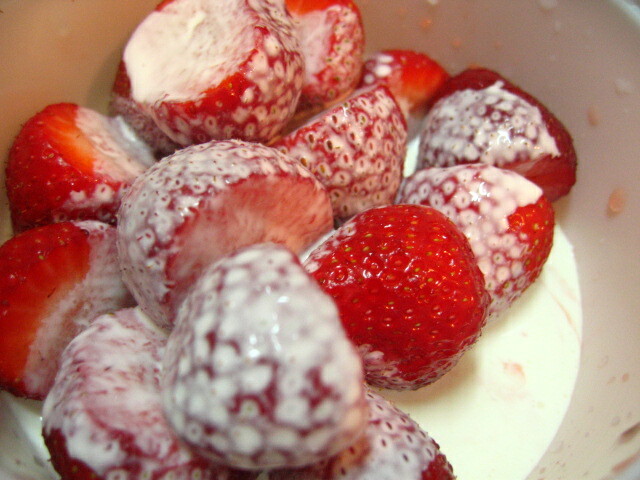 So I began to search through my fridge and pantry, trying to come up with ideas to use the rest of the strawberries. There was a bottle of cava (Spanish champagne) staring back at me, having been bought a week before and seemingly upset that it was sitting there, still unopened. And I thought… wouldn’t a cheesecake that had both the strawberries and the champagne in it be simply divine? Preparation time: 30 minutes (with electric mixer); 7+ hours refrigeration to set. 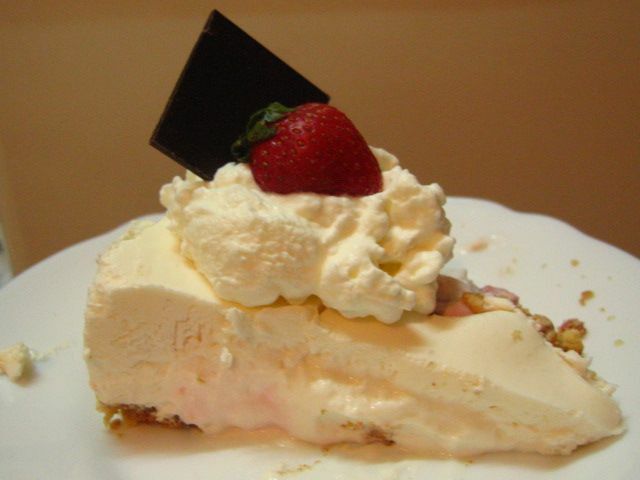 There was a rum eggnog cheesecake I used to make with Eagle sweetened condensed milk; I can’t find that recipe online anymore, but I tried to adapt some of the techniques to create a champagne cheesecake with pieces of fresh strawberries stirred in. The old recipe called for egg yolks to be boiled with the gelatin, rum, sugar, and water, and that the whites be beaten to create a raw merengue to be folded into the cheese and cream mixture. I decided to try to make this pie without the eggs, knowing that my friend Cecilia (who is my dutiful recipe experiment guinea pig) is a bit wary about eating raw egg. Fair enough–let’s see what can be done without the potential salmonella issues. I recently learned (also thanks to Cecilia) that champagne is much like cognac–copied throughout the world but under different names. So just as Armenian “brandy” was the Politburo’s cognac of choice; Italian “prosecco” and Spanish “cava” are more or less the same as champagne but unable to claim the title because of the regions from whence they come. So, basically, what this means for us is that we can easily keep the semblance of luxury for under $10. To make a basic pie crust, place the digestives in a ziploc plastic bag and pound into fine crumbs. Pour crumbs in bowl, stir in sugar, and pour butter over mix and stir in with fork. Once the crumbs are evenly coated by the butter, press the mixture down into a 9″ pie plate (or, if you’re out of pie plates like me, any bakeware will do), and bake for 10 minutes at 250˚F (120˚C). Set aside. Bring 1/4 cup of sugar in 1/4 cup water to a boil in a small pot. For a slightly more creamy final texture, add beaten egg yolks here, making sure not to let the yolk scramble by ensuring absolutely constant stirring. I omitted it this time around. Add gelatin, continuing to stir constantly. If you prefer to boil your champagne to remove some of the alcohol, lower the heat and add it here, being careful not to let the bubbles boil over. Let simmer, stirring constantly. Keep in mind that the longer you cook the champagne, the more alcohol is removed; however, it will take quite a while to remove all of it. I suggest just a few minutes, if that; the resulting alcohol level should be low enough to keep from having an effect. If you don’t mind keeping the alcohol in the pie, I recommend to skip this last step and set the champagne aside for the moment. Pour the pie filling over the baked pie crust. Refrigerate several hours or overnight. Texture will be quite creamy but should hold together. That's what I'm talkin bout. Couldn't quite wait for it to fully set, so it had a bit of a rough landing here. Still absolutely delicious!!! If you have extra filling, fill up some parfait cups and chill those as well–perfect for individual servings. Garnish as desired. My recommendation is a dollop of whipped cream and half a strawberry (and maybe a thin wafer of dark chocolate if you have it on hand), served with a glass of champagne! For general tips on cooking with wine, click here for a Cooking Light article on the topic. I make pound cake with eggnog and it turns out amazing. Really smooth texture, nice color as well. I think eggnog cheesecake is interesting, too. Let me know when you found the recipe, I’d like to try it, too. 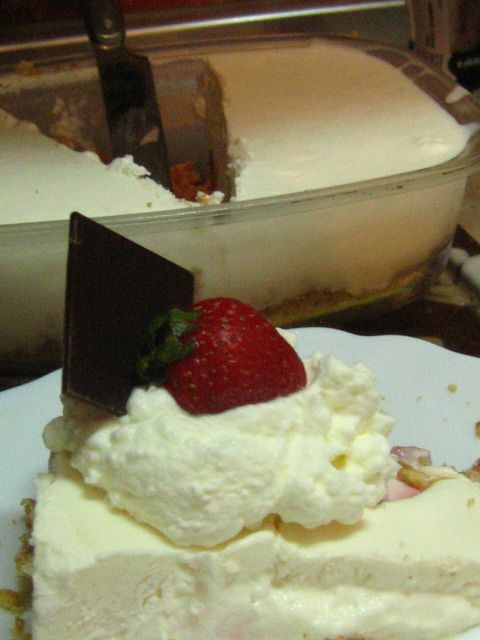 Your Champagne Strawberry Cheesecake looks amazing by the way. It’s too late for me to whip up this recipe tonight, so I think I’ll just go out now and have a cheesecake to go just to ease my craving, lol! Thanks Eggnog! The pound cake sounds fantastic, sounds like my kind of cake!! The eggnog cheesecake–one of the best things I’ve ever made–was from a recipe on the Eagle Brand condensed milk site, and it doesn’t seem to be there anymore. I may have a copy of it printed off somewhere, I’ll try to find it! This really is one of the most delicious things I have ever made, and it inspires me when I’m making other cheesecakes. Hope you’re able to try it out! Crust: In a medium bowl, combine graham wafer crumbs, sugar and melted butter. Press firmly into a 9-inch springform pan. Bake in 350 degree F oven for 10 minutes. Let cool. Filling: In small bowl sprinkle gelatine over rum; let stand for 5 minutes. Add boiling water and stir until gelatine is dissolved. In a small saucepan, whisk together egg yolks and sugar. Whisk in gelatine mixture and cook over medium heat, stirring constantly until mixture comes to boil. Remove from heat and set aside. In a large bowl with electric mixer, beat cream cheese, sweetened condensed milk, gelatine mixture and vanilla extract until smooth. Chill 20 to 30 minutes or until partially set. Beat egg whites until they hold soft peaks; beat in 1/4 cup sugar until mixture holds stiff peaks. In a small bowl whip 1/2 cup whipping cream until thick. Fold egg whites, then whipped cream into cream cheese mixture. Pour over prepared crust. Chill until set, several hours or overnight. To serve, whip remaining cream and spread over top, sprinkle with nutmeg.